Have you ever thought of volunteering for a festival or just getting involved with something you are passionate about? We all did and three years down the line, the Big Bookend is fast becoming part of Leeds’ cultural calendar. 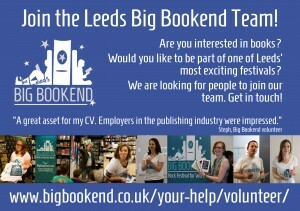 Read on for my 5 top reasons why you should volunteer for the Leeds Big Bookend. A lot of our inspiration for the Big Bookend comes from Leeds itself. The place, the people and their stories are what make Leeds the city it is today. Community is a big part of the Big Bookend, and our events and projects reflect people from a variety of groups in the area, from students to retired church folk, from asylum seekers to recovering addicts. For me, the Leeds Big Bookend is about bringing people together through literature and art, and being part of something that has never been done before. 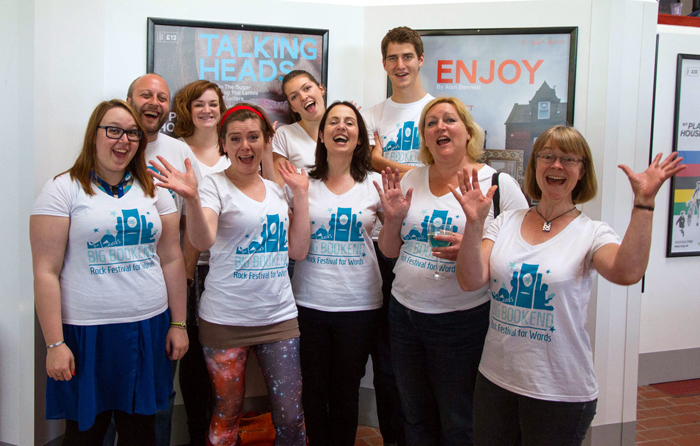 Of course, you don’t have to have anything to do with Leeds to get involved – in fact, most of the Big Bookend team and volunteers are not from Leeds! Some of us live and/or work in Leeds, some are students of Leeds universities or colleges – I happen to be none of these things, but we all share an interest in putting Leeds on the literary map, and doing something positive. The Big Bookend programme is so diverse, there really is something for everyone! The beauty of having such a range of events is that you start off with your real interests e.g. 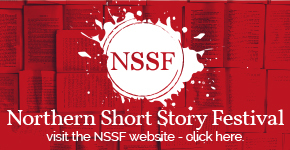 events for poetry or crime fiction, and you come out with a wealth of knowledge covering so many different subjects. Over the last couple of years with Big Bookend, our events have included insights into history, politics, music, sport and literature. 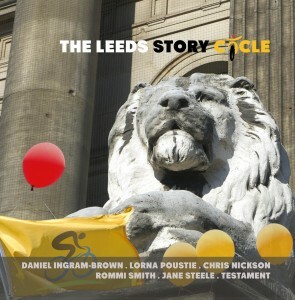 From a one-woman musical relating the lives of the Suffragettes to the spectacular Leeds Story Cycle project. From Tony Harrison’s personal recollection of writing war poetry on the Bosnian frontlines to fascinating tributes to the WW1 centenary. The Big Bookend touches on so many areas that you are guaranteed to come away with something new. If you are looking for ways to get your CV noticed by employers, volunteering for the Big Bookend is really a no-brainer. My role at Big Bookend involves editing and scheduling the festival’s blog, and supporting it with social media, along with writing press releases for events. While it seems so difficult just to get work experience these days, the Big Bookend was brilliant as I could expand on the skills I needed through volunteering. The experience you can gain from being involved in a literary festival would be sought after in a multitude of industries: book publishing, events management, journalism or any media related career, along with marketing, communications and publicity roles. Being able to give examples of where you have used particular skills (organisation, creativity, initiative, communications, teamwork etc) in this kind of environment would really stand out to employers. What’s more, the fact that it is voluntary work highlights that you are keen and willing to put in the effort to improve your skill set. If you can show that you are passionate and actually doing something you are interested in, for free, employers will recognise that you are taking it seriously. Book-lovers, theatre-buffs, students, budding writers, poets, playwrights and reviewers – you’ll find them all here at the Big Bookend! If you are trying to broaden your connections and meet people who share your interests in the local area, the Big Bookend is a great opportunity for networking. Before Big Bookend began, literary fans and writing talent around Leeds didn’t know that each other existed, and now we have created somewhere for you all to connect. 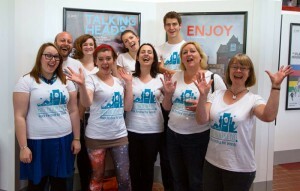 We have said it year after year – the Leeds Big Bookend simply wouldn’t happen without our volunteers. There is so much involved in organising a literary festival that we could accommodate your skills whatever they may be. 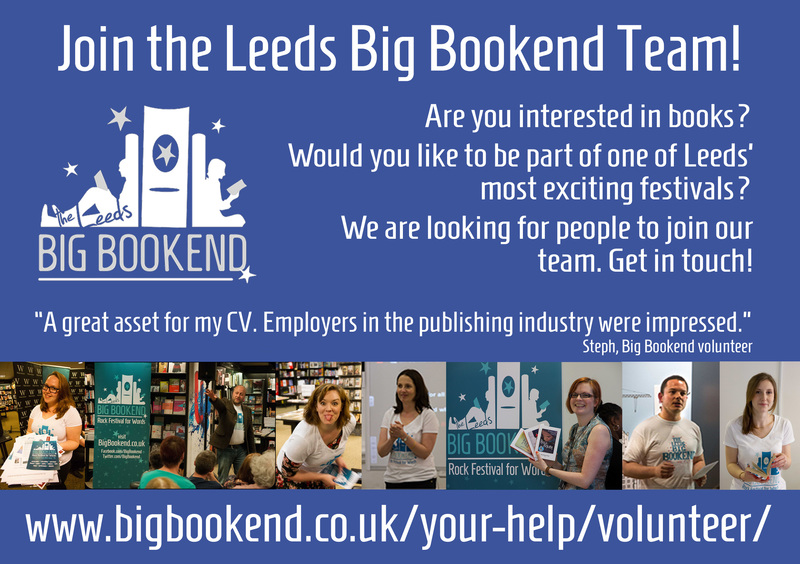 Your role as a Leeds Big Bookend volunteer could be: photography, logistics, art and design, creativity, organisation, promotion, marketing & PR, social media campaigning, or simply a helping hand on-site at the events. If you are interested in getting involved with the festival, please do drop us an email, info@bigbookend.co.uk, tweet us @BigBookend or find us on Facebook. We would love to hear from you!